Vaccines represent the most successful and sustainable tactic to prevent and counteract infection. A vaccine generally improves immunity to a particular disease upon administration by inducing specific protective and efficient immune responses in all of the receiving population. The main known factors influencing the observed heterogeneity for immune responses induced by vaccines are gender, age, co-morbidity, immune system, and genetic background. This review is mainly focused on the genetic status effect to vaccine immune responses and how this could contribute to the development of novel vaccine candidates that could be better directed and predicted relative to the genetic history of an individual and/or population. 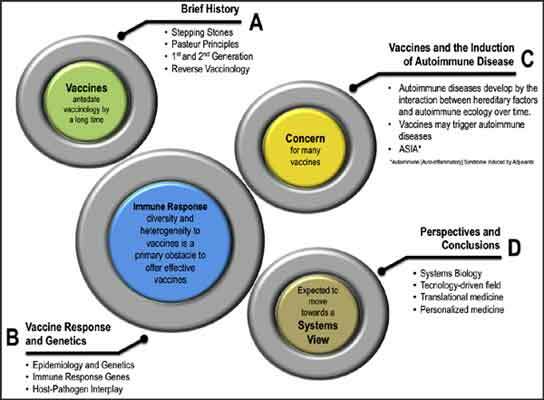 The text offers a brief history of vaccinology as a field, a description of the genetic status of the most relevant and studied genes and their functionality and correlation with exposure to specific vaccines; followed by an inside look into autoimmunity as a concern when designing vaccines as well as perspectives and conclusions looking towards an era of personalized and predictive vaccinology instead of a one size fits all approach. Vaccine, Personalized medicine, Genetics, HLA, Autoimmune ecology, Infection, Autoimmunity and systems biology. Center for Autoimmune Diseases Research (CREA), School of Medicine and Health Sciences, Universidad del Rosario, Carrera 24 #63-C-69, Bogota, Colombia.